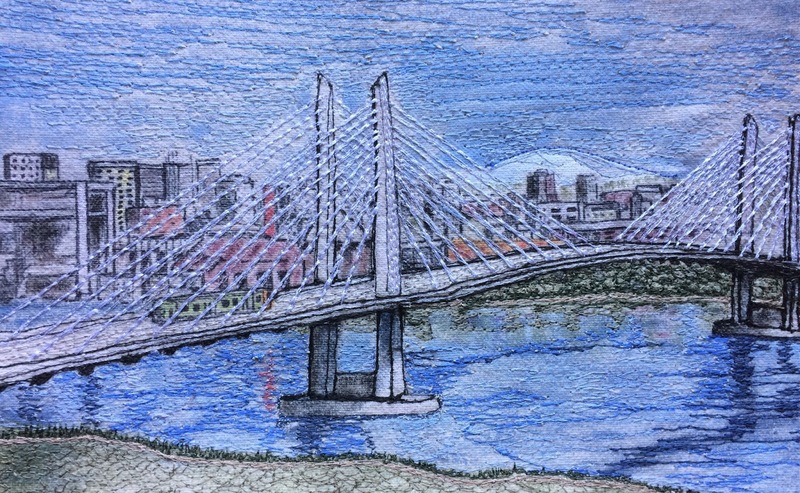 The Tilikum Crossing, Bridge of the People, opened for general use on September 12, 2015. 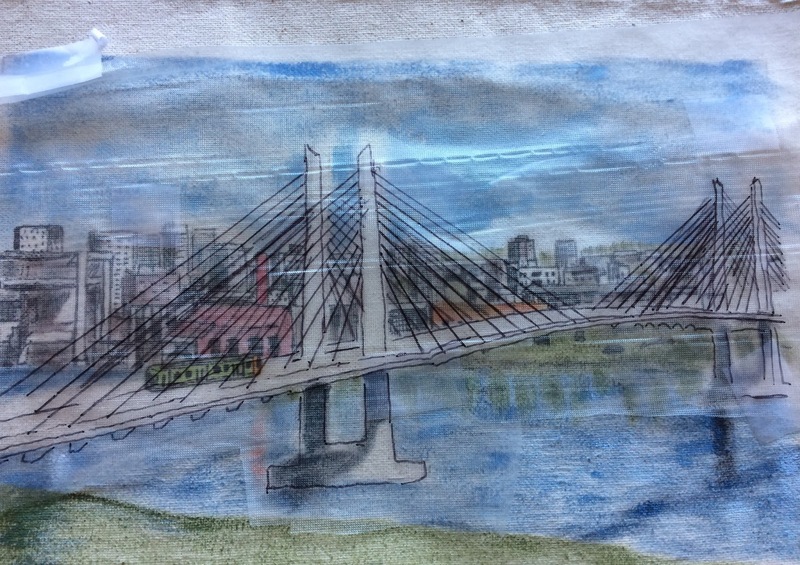 It is open to MAX, Portland Streetcar, TriMet buses, pedestrians and bicycles. Public vehicle traffic is not allowed. It is a sparkling beauty during the day, and breathtaking at night with a mesmerizing light show. One of the best ways to view the bridge is on the Portland Aerial Tram. This TriMet web page has great video of the lights and interesting facts about the science behind how the lights work. 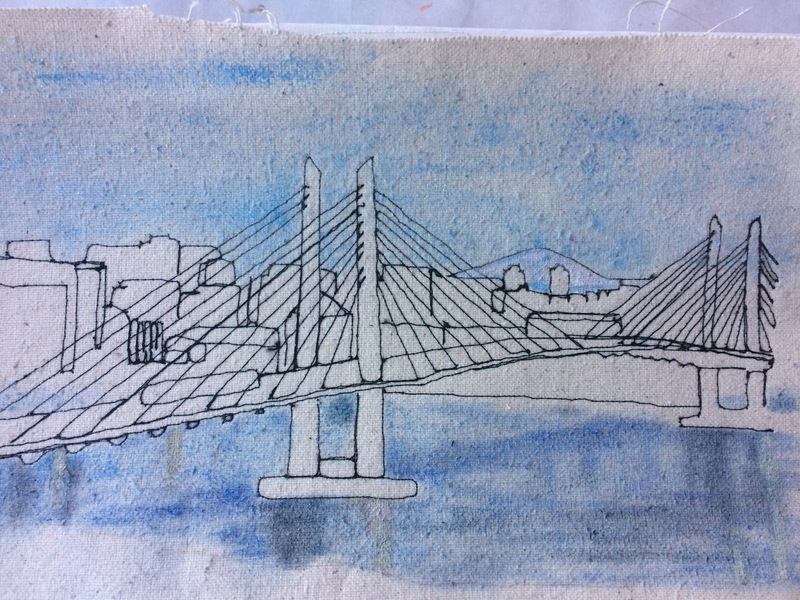 I was so intrigued with the lines of the bridge, that I completed two thread sketches from the same photo posted on Wikimedia Commons by Steve Morgon, 2016. Some of you have already seen the second thread sketch posted on my Facebook banner. Each thread sketch was created in a slightly different manner. A few pictures and captions prove there are many ways to achieve similar end results. 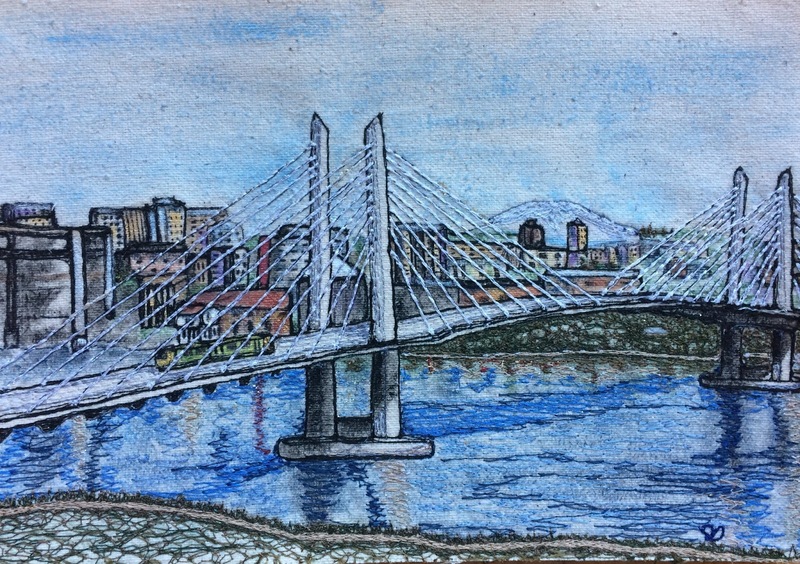 First thread sketch completed, approximately 6"x9"
I used light pencil marks to define the background buildings and bridge structure. Careful to leave bare where the bridge would be, the background colors were added using acrylic paints. 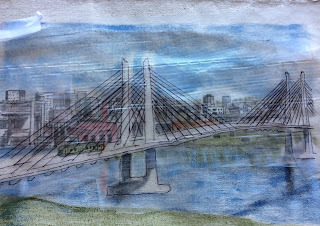 After the background paint was dry, I layered water soluble stabilizer with the bridge lines marked in permanent ink. The lines were stitched and stabilizer removed. Some of the acrylic paint washed away while rinsing away the stabilizer. 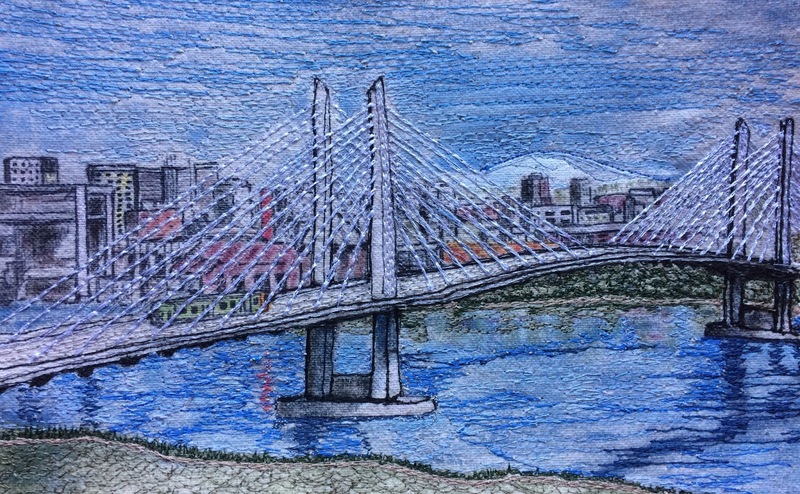 I added blue thread stitches to the sky to create a little more interest. Even though some of the background colors are muted, the result is satisfactory. 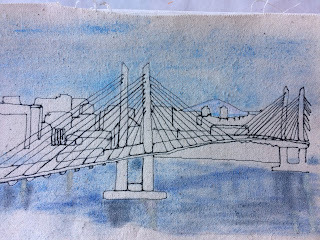 I followed my usual method to trace the main lines of the background structures and the bridge on water soluble stabilizer. These basic lines were stitched entirely in black. After rinsing away the stabilizer, blue sky and water were painted with acrylic paint. Instead of acrylic paints, I used watercolor pencils to see if I could obtain more detail in the background structures. 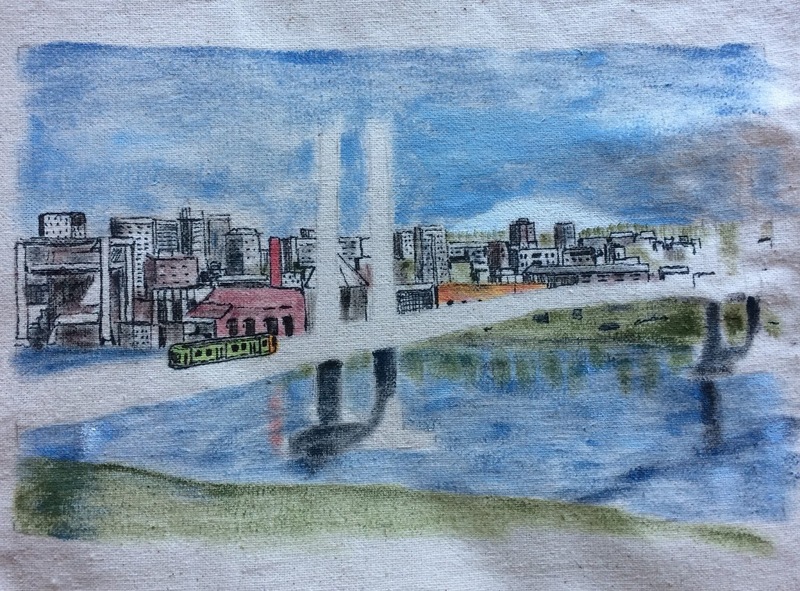 I had never used watercolor pencils prior to this and was unsure how they would work on the canvas. 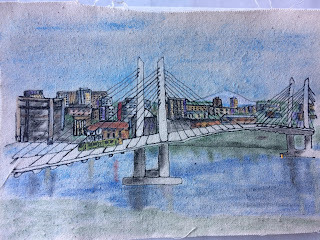 It is not clear to me that the detail is any finer than the original sketch using acrylics. Perhaps a little more practice is required! 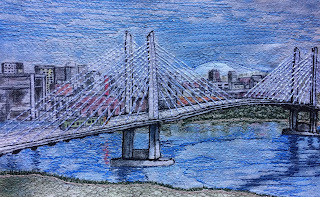 The bridge, water and riverside landscapes were stitched. Bare canvas showing through the blue sky paint created enough interest that I felt stitches were not necessary. 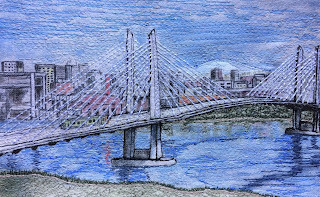 This second thread sketch is currently showing on my Urban Stitcher Facebook banner. Thank you for visiting. 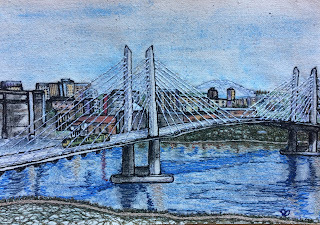 I am working on more Portland bridges using a couple new techniques and products. I hope you will stop by again.